An historic skiing town on the picturesque side of Mont Blanc, it has a reputation as having some of the most spectacular and exhilarating skiing and boarding available anywhere in the world. Chamonix has it all, with pistes above 2500 metres, skiing and snowboarding is assured throughout the season. When you have finished on the slopes there plenty on offer as the town is very lively with numerous bars and restaurants. Chamonix, deemed as Europe’s capital of extreme skiing is not considered as the best of resorts for beginners. There are a few short nursery runs in Chamonix town and a few nice blues in Le Tour but most of the terrain is more often than not challenging. For intermediates it is a good resort if you are trying to improve, as the runs can be steep and narrow forcing you to practice your technique, most intermediates find what they want by sticking to Vallée Blanche. 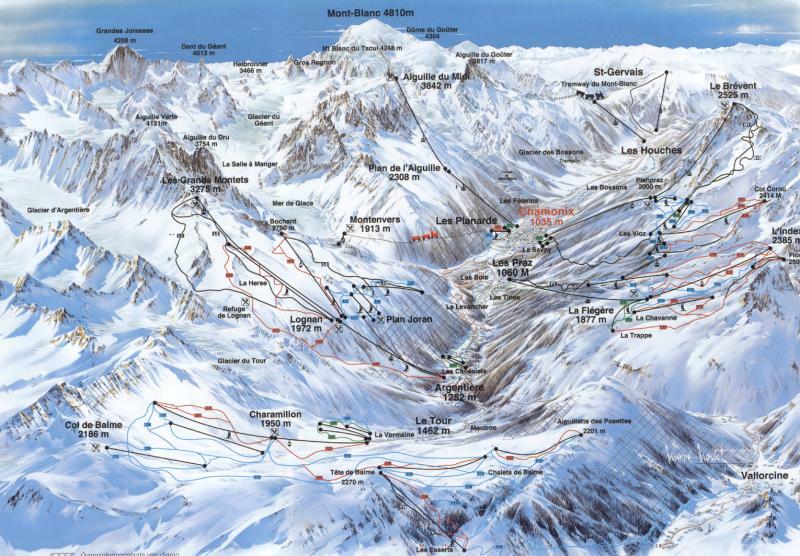 More advanced skiers generally head to Argentiere’s famous Les Grands Montets. Although Chamonix's other areas are also well worth visiting. The lift system is slowly being improved which has helped with queues but there is still a long way to go. The older slower lifts are being replaced and new links are being added to reduce long waits. This lively town is host to a vast selection of shops bars and restaurants along with 7 clubs. Due to the spread of the ski areas there is not a obvious meeting point for a drink at the bottom of the slopes, so most people go back to the town, therefore the nightlife starts a little later in the evening. Amongst all this partying you can find quieter places to relax after the days exertions with relaxed end of day drinking in many of the restaurants. There is a large casino in the centre of the town should you wish to try something different and a large cinema to keep up to date with the latest offerings.